Where to find Bala hotels near an airport? 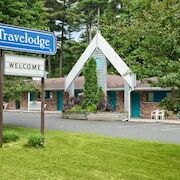 Where can I find hotels in Bala that are near tourist attractions? 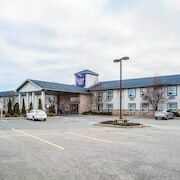 If you'd like to vacation in Bala, do think about pre-booking a room as early as possible, because you won't find many accommodation options in close proximity to the center of town. The JW Marriott The Rosseau Muskoka Resort & Spa, Ontario, which is the nearest accommodation, sits 15 kilometres (9 miles) from downtown Bala. Alternatively, investigate the Windermere House, located in Ontario, which is 15 kilometres (9 miles) away. The Bayview Wildwood Resort can be found 30 kilometres (20 miles) away from the middle of Bala. Another alternative is the Rocky Crest Golf Resort, which is positioned 25 kilometres (15 miles) away. 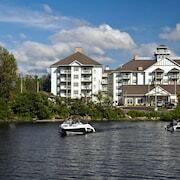 The Residence Inn by Marriott Gravenhurst Muskoka Wharf and the Christies Mill Inn & Spa are some other places to stay in Bala. After you have spent time in Bala, ensure you allow time investigate Southern Ontario's other attractions. Southern Ontario has beaches and coastal plains, and common Southern Ontario destinations include traditional villages and churches. Active travelers may also try their hand at skiing, cross-country skiing and snow shoeing here. Gravenhurst is 25 kilometres (15 miles) to the southeast of Bala and is where you'll find Muskoka Bay Golf Course and Taboo Golf Course. The Howard Johnson Inn Gravenhurst and Pinedale Inn are some of the accommodation options in Gravenhurst. 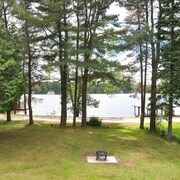 60 kilometres (37 miles) to the northeast of Bala, is Dwight, home to the Logging Chain Lodge Cottages and Dwight Village Motel. The Dwight Beach and Marsh's Falls are popular sites to explore when you're in Dwight. If you like sports and love watching local games you might like to take a trip to Barrie Molson Centre, which is 80 kilometres (49 miles) to the south of Bala. Book accommodation nearby to the action at the Holiday Inn Express Hotel & Suites Barrie or the Hampton Inn & Suites Barrie. If you are traveling into or out of Jack Garland Airport and plan to stay nearby try Hampton Inn by Hilton North Bay or Comfort Inn Airport. What are the most popular Bala hotels? Are there hotels in other cities near Bala? 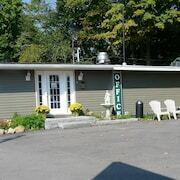 What other types of accommodations are available in Bala? Explore Bala with Expedia.ca’s Travel Guides to find the best flights, cars, holiday packages and more! Flights from Pearson Intl. 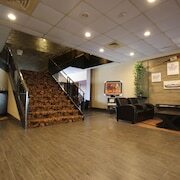 to Capital Intl. Flights from Pearson Intl. to Incheon Intl.